Celebrities lashing at the paparazzi’s hoax news isn’t too uncommon. But April Fool’s Day is synonymous to Doomsday for the paparazzi. Thinking why? It is that time of the year when the paparazzi get a taste of their own medicine. We don’t know whether it is a form of retaliation or simply a stunt to fool the public. What we clearly know is that we just got fooled by some of the biggies from the entertainment industry. Get ready to find the most entertaining celebrity April Fool’s Day pranks that broke the internet in 2019. Bieber’s marriage to Hailey Baldwin was a hush-hush affair. But little did we know that this couple would start a family so soon. 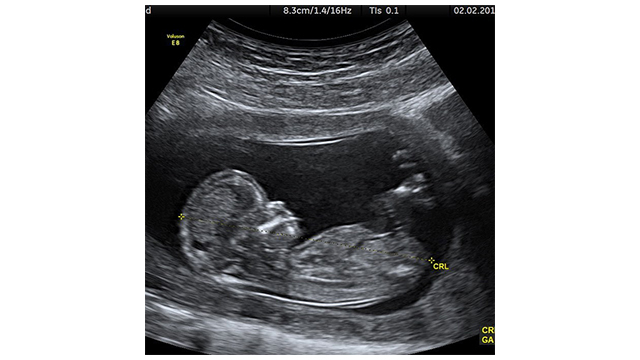 On April 1st, the singer posted a sonogram picture on Instagram without a caption. And Instagram stormed with Justin’s revelation. Whereas Hailey’s comment ‘Very Funny’ on Justin’s post gave us a hint that it could just be a prank. But to our surprise, Justin did not give up! He posted another picture of Hailey in a hospital with a caption ‘If you thought it was April Fool’s’. 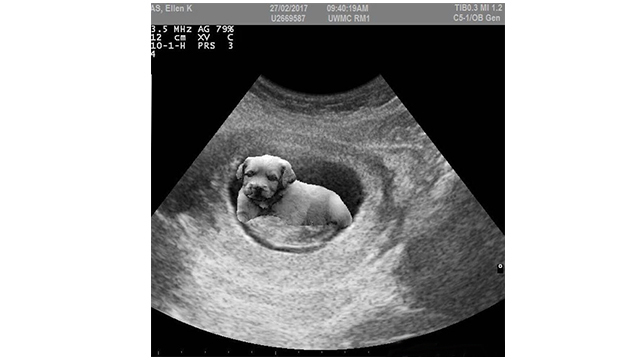 While the ‘Congratulations’ comments were flooding, Justin posted yet another picture of a sonogram with a puppy chilling inside Hailey’s womb. Smart prank indeed! Maisie William aka the infamous Arya Stark gave the world the biggest GOT spoiler ever on The Tonight Show Starring Jimmy Fallon. On being asked about a little crumb about GOT’s final season, Maisie unexpectedly said ‘During shooting, the final days were really emotional — saying goodbye to all the cast. Because when I found out that Arya died in like, the second episode —”. The crowd went ‘dead silent’ at her revelation. Maisie started panicking and went off-stage. Fallon followed her and turned around to surprise the audience by confirming it was an April Fool’s Day Prank. 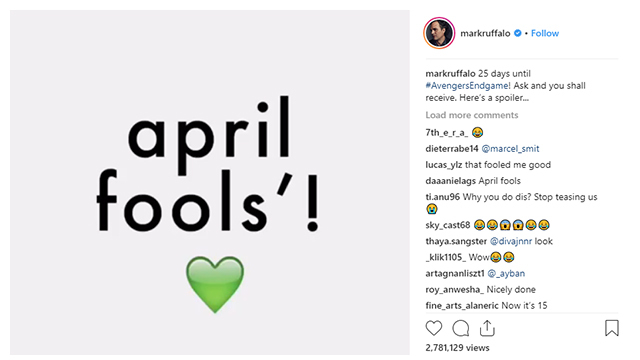 Mark Ruffalo promised a spoiler for Avengers: End Game on Instagram. But Hulk got the Marvel fans trolled with his April Fool’s Day Prank. We sure got bummed but many of us don’t want to get any spoilers before the movie releases later this month. Let’s just pray the spoilers to rest in peace until the release of the End Game. The DC Universe can’t stay behind Marvel. And we are not talking about the release of Shazam here. A few days before Shazam’s release, a trailer for Aquaman 2 went viral after being uploaded by Warner Bros. The fans got bummed when they realized the video was a slick move to promote Shazam. The opening of the fake Aquaman trailer showed ‘the king shall reign’. Within the blink of an eye, Shazam enters the trailer only to tell it is releasing on Thursday. We just got pranked and we can only hope that the next Aquaman trailer isn’t a hoax. 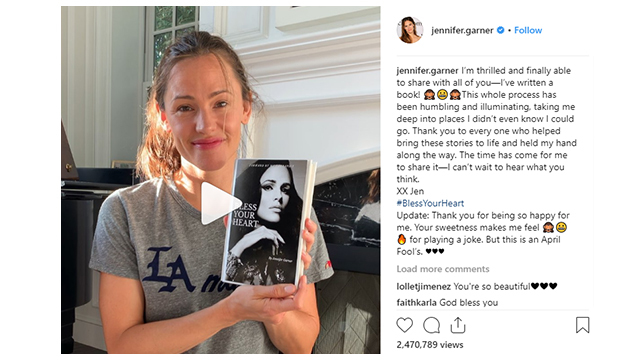 And we thought we could read all about Garner’s deepest darkest secrets. 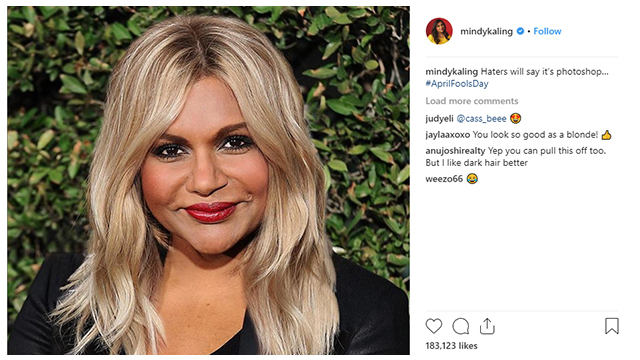 Mindy Kaling from ‘The Mindy Project’ stuns Instagrammers with a photo of herself in blonde hair. Her caption said, “Haters will say it’s photoshop… #AprilFoolsDay.” and no matter what we think, her April Fool’s Day photoshopped avatar was quite hilarious. Our very own Jon Snow is famous for pulling savage pranks on his wife Rose Leslie. This year he tried the same and got backfired for it. Kit appeared on the show Late Night With Seth Myers and gave us interesting details about his April Fool’s Day prank on his wife. He said “Leslie won’t drink any other Almond milk, so I wrote an article about how this company who makes her favourite almond milk was going under because of Brexit. This backfired.” After reading the article, Rose called Kit’s P.A. and ordered Almond Milk in bulk using Kit’s credit card. We can just say that don’t pull a prank on your wife otherwise you may become the next Jon Snow. 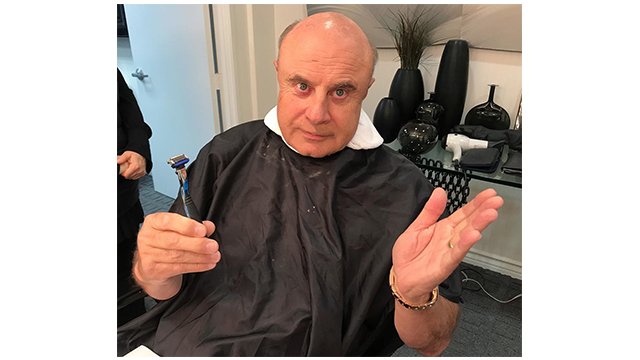 #8 Did Dr. Phil Shave? Dr. Phil may be a philanthropist with 25+ years of experience in psychology, sociology, and observation. But when it comes to pulling pranks, he can definitely top the charts. In his recent Instagram post, we could see him shaving off his 25-year-old moustache. But who knows whether it was an April Fool’s Day stunt or was he simply trying to experiment with his looks?